My room is clean. My room is cleaned because I cleaned it, not by buying a little vacuum cleaner like I said I would but by using a dustpan I bought from StarMarket on carpet because it works surprisingly well on carpet. It’s a little dustpan and a little sweeper, one you have to kneel down on the floor to use, and I swept up the kitchen and the bathroom too. I walk around in the kitchen now with bare feet. It’s very pleasurable. I sat with my headphones in my ears in my air-conditioned apartment and ate cherries (they were cheap because I bought them at Haymarket last weekend). They were very pleasurable too. I am so, so, so, so lucky. I am sitting in the Saxe lab meeting on Tuesday where I’ve decided to ask two people to move over to squeeze a place for me at the table instead of sitting around the edge of the room. They do so easily and with a smile, even though I’m not in the Saxe lab and am here, as I have been all of the previous weeks, out of the generosity of Prof. Saxe’s heart and mind and the easy welcome of her lab’s members. Today’s meeting is loosely about scientific ethics, focused on scientific criticism and how it should be executed. I’m listening, upset that I’m not contributing, until I realize it’s mainly the post-docs who are speaking, and they’ve had five plus years of training on me. Prof. Saxe is discussing one of the rare scientists who faked their data, and how it was hugely stressful on the Harvard-MIT community, and I’m listening to her and watching Tyler make a comment and it hits me, over the head like I’m so thankful it does, every time, that I’m at MIT. I’m at MIT with one of the most famous rising stars in cognitive science with some of the best students in the country and I’m sitting at a table with them and listening to what goes on behind closed doors and I could even say something if I wanted. I’m here and I’m listening and this is exactly where I want to be. I’m some kid from a suburb in Minnesota with one parents who was born in China and one parent who was born in Illinois. I was born in California and have two sisters and cat, and my parents had me learn piano, learn French, learn sports and math, and I learned some Spanish and did more school and learned lots. And then I went unexpectedly to Wellesley and unexpectedly to MIT and now I’m going unexpected to Cambridge and I’m sitting in Prof. Saxe’s lab meeting and it’s all going to be fine, fine, fine. Because I have fantastic people and a good brain and fantastic luck and more fantastic people. My parents, my siblings, my teachers, my professors, my friends, my mentors, my role models. I have the desire to do well and am lucky enough to like working out, eating healthy, trying hard, striving. And I have the people around me to make sure I work smart as well as hard, to help me to where I want to go, to teach me with what I struggle with, to be patient and caring and loving. To my friend who told me she wasn’t sure what she wanted to do: I said, “well, what really decided me…” and then I stopped, because the answer was “things like the Saxe lab meetings.” Watching really, really intelligent people talk about things that they are passionate about. Watching Prof. Kanwisher introduce Prof. Deheane as a lecturer, saying “and he received many fancy awards for this work. But it’s our great pleasure to have Prof. Deheane, one of the greatest contributors of ideas in this field.” Volunteering as a subject and talking to post-docs whose faces I know from their websites. Going to lectures. Making progress in my summer work for Katherine, reading really awesome papers, inundating my brain and watching them flow over my head, searching for bugs in Matlab. Mentoring and writing and poster-making and learning how to talk, how to email, how to teach. Endless applications, the process, the key players, how to search for the backstories. It’s my world now, and it will be my world, and I am so, so, so, so lucky. My mother said to me a few weeks ago, when I was talking about graduate school: “Yes, I hope you get all that you want.” Yes, me too, I hope that I get all that I want. All that I want. I want. Me? What I want? A science education was not necessarily what I want, it was what my parents want, the expectation that I grew up with in high school and college. I love it now, and wasn’t at all opposed to it then, but it was never just me—it was them, too. Now that I’ve graduated, now that I’ve achieved that undergraduate science degree—it’s what I want now, not what the family wants for me. I want. Is it helpful to give him change, or would it be more helpful to work with him long-term? Why aren’t there many women on the streets? Who don’t I see on the streets? Is it helpful to give money to the shelters? Should I be thinking more about them, should I be thinking more about other people, not just the courtesies I must learn in scientific circles, how to write a good email, a necessary—in these circles—skill? I read at Wellesley about “imposter syndrome”. I read at Wellesley that I don’t know what it’s like to bear the expectations of a whole community. My roommate doesn’t understand when I talk about the pressure of walking into a male-dominated room, because she says that has never affected her. I don’t pay enough attention to racism. I don’t pay enough attention to sexuality. And these are issues at Wellesley / American socially-oriented news; what are the so many other issues I’m missing, lived by people with different experiences than I? Should part of my life be helping others, and if so with which of these issues? What’s the purpose of a human life? Is it the pursuit of happiness? Sexism is much worse in Ecuador, Tiffany tells me. People are dying in civil wars. People here don’t have homes. Their pursuit of happiness is not the same as mine. I’ve had a very pleasurable week. 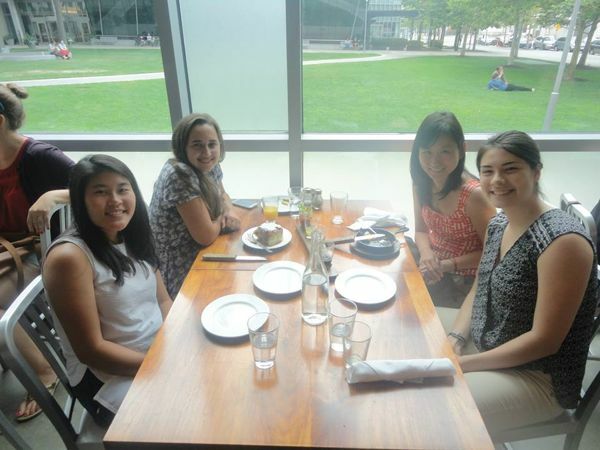 I had brunch with old lab members on Sunday, Sunday, all-you-can-eat sushi with other friends on Sunday, had a great presentation at Wellesley with Annie and Patricia on Monday, went to lab meeting on Tuesday, saw Tiffany again in her return from Ecuador, went to the Pixar exhibit with Tiffany on Tuesday, went to a lecture by Prof. Kanwisher on Wendesday, said goodbye to Patricia on Wednesday, shared a lab birthday cake for Kaitlin’s birthday on Thursday, filled out the online part of my visa application on Thursday, finished my part of the calibration guide for Katherine on Thursday, went to a lecture by Prof. Deheane on Friday, finished my poster for Beckman Conference on Friday, helped Katherine with the MEG calibration on Friday, cleaned my room and did chores on Saturday, went over to Kaitlin’s apartment for a birthday party on Saturday, went to dimsum with Erin and David on Sunday (it was really lovely), talked to my sisters and parents on Sunday, and worked out and read a lot through all of the days. Really, really lovely week. Since I have a little mental headspace, I’ve been trying to backpedal. Give myself a little context, though I keep on zooming in and out again with alarming speed. (You can see it here, in the inconsistency of the prose.) No answers, of course, but the content weaves through everything outside my little academic bubble. I love my life. I love clean floors, crisp cherries, lab discussions, lectures, friends, family, saying the right thing, desserts, cool ideas, accomplishing something. I love the people in my life, the circumstances of my life, the work that makes it happen, humanity which makes it turn. I am grateful to the world and all of the individual people that made the work I do happen. I love you all. I thank you all. And I’ll continue asking myself questions, for you, or for me, or just I.
I want, right? All I want :). Brunch with old lab people! Galen, Kaitlin, Jane, and me :). 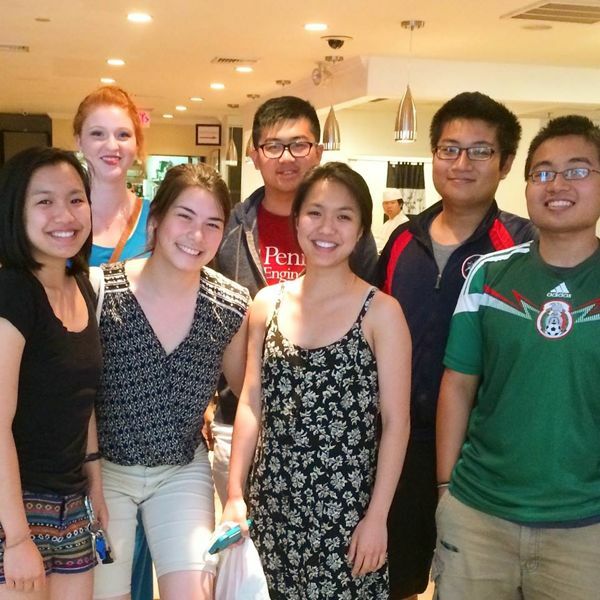 All-you-can-eat dimsum with this awesome crew :). Patricia, Ray, Andrew, then Audrey, me, Katherine, and David. Audrey and Kat are both Wellesley friends from my year– Kat and I are particularly close from thesis-ing together, and David’s an MIT friend from class. Ray went to high school with David, and Andrew is David’s little brother. Patricia is a rising Wellesley sophomore who works in my lab. I love how everyone weaves until friends-of-friends are just friends :). 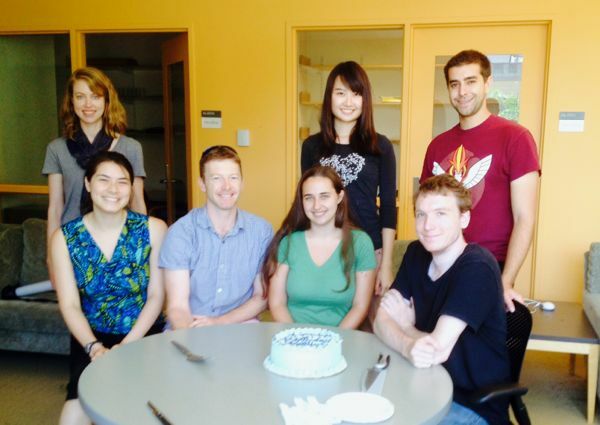 Kaitlin’s bday pic– Bevil bought her a cake :). Katherine, Annie, Walid, me, Bevil, Kaitlin, and Josh. Patricia just left the day before, otherwise she’d be behind Bevil! I’d also like to mention that it was at this juncture that Bevil professed to not knowing what Pokemon were, and that my Pikachu looked like a demonic robot thing that was holding a grenade. I pointed out that Walid was wearing a shirt with a Pokemon on it. Oh, lab. 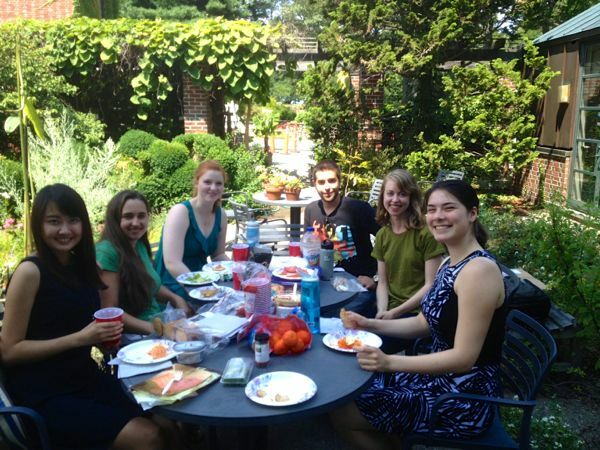 Lab picnic after a successful Wellesley presentation! It was actually spectacular– everyone spoke really well, and we had lots of great questions and interest at the end. Annie, Kaitlin, Patricia, Walid, Katherine, and me, and Bevil’s taking the picture. 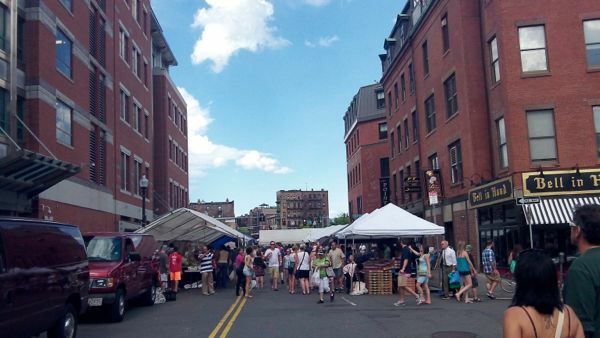 I love the festivals in Boston. 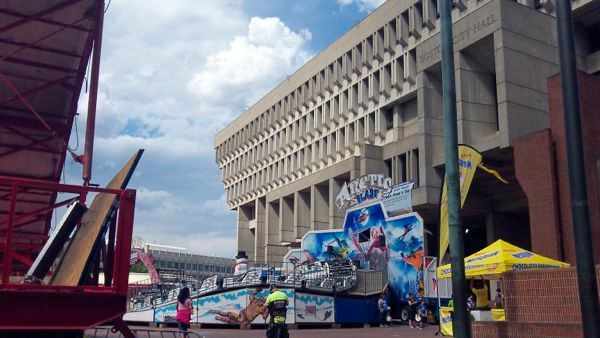 There was an actual theme park set up outside the city hall when I walked by. Lots of Puerto Rican music too. Very catchy. And Haymarket, my lovely :). Most of it’s a lot more cramped than this, but I figured I should include a pic. 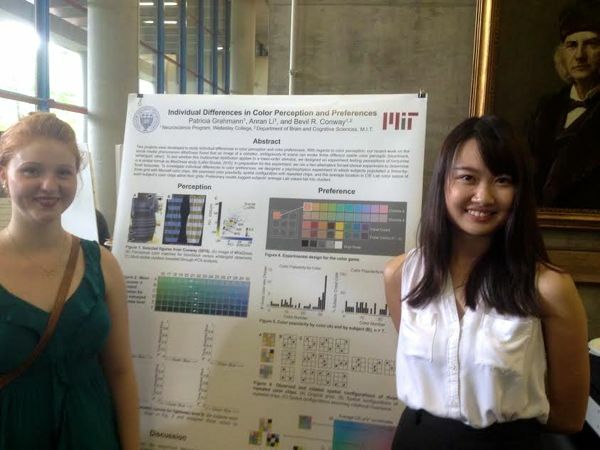 Patricia and Annie standing in front of their poster at Wellesley’s Summer Science Research program’s poster session. Great pictures this week, right? 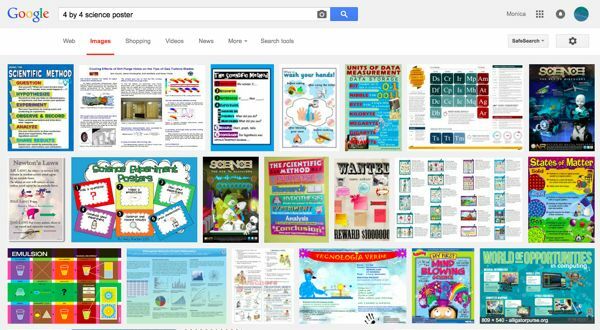 Just something vaguely-twitter like… Google Images’ difference between “scientific” and “science”. 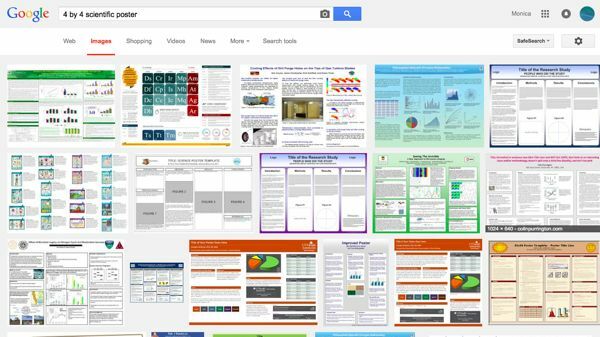 I adore Google. Final funny story– at the party on Sunday, people were handing me various alcohols to try. At one point, Kaitlin handed me a plastic cup of something clear. I sipped it. And told her, “uh, this one tastes like nothing”. Turns out it was water. Figures.